After watching a particular spot on south street turn over very quickly in the short time I’ve lived in the neighborhood, I was intrigued to finally see a sushi spot open up there. So on a night when we had out of town guests over, we walked over to check out Kidari Sushi Yatai, on South St, between 18 and 19. On a weeknight, the place was pretty busy! We showed up just in time to be able to get a table for 6. It’s a byob! The miso soup was good and the house salad, the typical salad you get at a sushi place with the ginger dressing, was especially good. 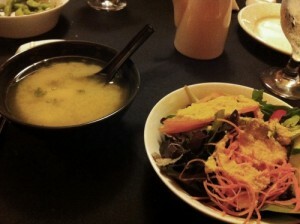 It was rather large with mixed greens, cucumbers, carrots, tomatoes, and a fresh ginger dressing. This is one of my favorites types of salads, so it was a good sign that the rest of the meal would also be good! The Sushi & Sashimi on table for two. We’re not sure why they call it “on the table” instead of “regular” like most places do, but hey, it must be their thing! This was a large assortment of various sushi and sashimi, and it also included a dragon roll, a spicy tuna roll, along with the soups and salads. 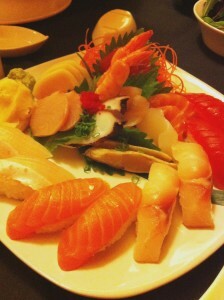 It was a nice variety of fish for the sushi choices and sashimi choices, and everything was fresh. We also got some more adventuruous and curious rolls. At the bottom is the Texas Roll – a yellotail, roasted shallot, and avocado roll topped with jalapeno, crab meat, and bacon. Yes, I said bacon! 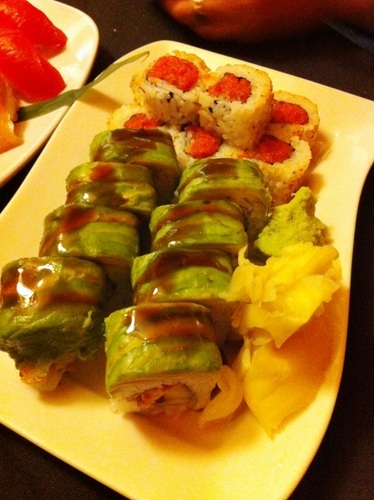 We had to order it, just because, and it was a bonus that it was good! 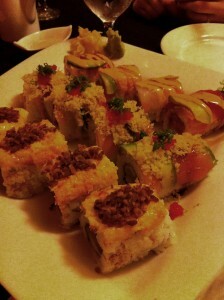 In the middle is the Rittenhouse Roll – salmon, avocado, red tobiko, scallion and crunch on top of california roll. Also very good. And in the back was one of the special rolls of the evening, whose name I totally forget. They were all great. In fact, all of the food here was great. And I was so, so, so happy because of it. The service was very friendly and I can’t recommend this place enough as a nice new neighborhood sushi choice.